Humankind used to search for fountains of eternal youth and elixirs that would give everlasting life. Then science reared its obnoxious head, and we collectively realized how stupid we all were. It's funny though, how history repeats itself. Nowadays humanity, and within that broad description I include traders, well MOST traders, is in a constant search for easy money. What trader, in his early days in the market, all wide-eyed and optimistic, hasn't, if for just a moment, thought about finding or creating the coveted holy grail. A system so precise it never loses and carries him or her on a pip-paved journey to wealth and prosperity. Too bad this pipe dream fails to point out that statistically speaking you are far more likely to be 'precisely' wrong than precisely right. I don't know about you, but I would rather be approximately right 80% of the time and precisely wrong the other 20, I can certainly live with that. The Precision PAMM is built on the idea the trading precision goes both ways. That is to say being wrong is inevitable, so trying to be perfect entries and exits is a waste of time. 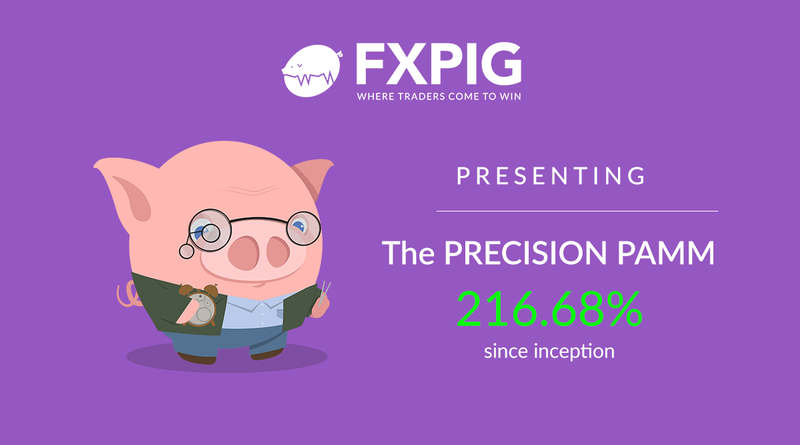 The Precision System consists of a mix of strategies, brought together to exploit a broad range of trends including one that looks to profit on pre-Asia range bound trading and another that uses impulse math to find and exploit SMART MONEY driven price action. So what makes this PAMM different? PRECISION makes it DIFFERENT. The underlying strategies open trades testing the overall market trend… being, as we like to say, 'approximately' precise, and once the trend is “confirmed” it adds additional positions looking to fully take advantage of the price action while it continues to trend. When the systems are wrong orders are closed using HARD stops*, ranging in value from 0.8 to 5% based on the account's balance. The pre-Asia trades, on any one of four different currency pairs, have a MAXIMUM hard stop of 5%. So if all four pairs are in trade and all four pairs hit their maximum stops, the total loss would be in the 20% range. The second system, which trades around the clock, Monday to Friday, taking trades on EURUSD and XAUUSD exclusively, sets MAXIMUM stop losses at 2% of the account balance, with an average stop of 0.8%. Naturally, the size of the stop depends on the currency pair and the strength of the recorded price impulse. But, so far, in forward testing, after several months, the system has maintained a maximum drawdown of approximately 13.5 %. With a set yearly ROI target of 100 % NET and a modest 30 % performance fee… the Precision PAMM may be a good place to park some risk capital. As you may already be aware, the process by which we choose the PAMMs that will eventually appear on our Featured PAMM list involves our risk department thoroughly evaluating every system that requests to be listed. We receive requests almost daily from traders and would be managers, and for each approval, there are dozens of denials, as over time our internal approval guidelines have gotten stricter and more refined to make sure that we only promote the most stable options to you, our valued clients. How nice it would be to say we have found the PAMM to end all PAMMs, the needle in the haystack, the pot of gold at the end of the rainbow, the PAMM that will make us all rich while carrying a guarantee of profit and zero risks. Yes how nice. Unfortunately for us PIGs are honest to a fault. And transparent. And smart. And awesome. Oh yes, and ultra-modest. That one is important. A perfect system in the real world is one that manages risk properly and you, as an investor, can do your part to keep risk in check by withdrawing profits regularly as regardless what you have heard when it comes to forex ALL your capital is at risk at all times. Time for you to get Precise... and start crunching some numbers, by checking out the PRECISION PAMMs stats on our official myfxbook stats page.Don't forget to also check out the PAMMs dedicated splash page right here at FXPIG as well.If you have any lingering questions or simply want to get the LPOA signed and jump in feet first... send us an oink, PIGs never sleep. Read more about our other featured managed PAMM accounts here.